AussieComps.com - NEW Australian Competitions & Giveaways Listed Daily! G'day Compers and welcome to AussieComps.com! NEW giveaways are listed here every single day. AussieComps.com shares links to new and exciting Australian competitions, giveaways and contests with prizes worth tens of $1000s every single day of the year at no cost to you! Check out all of the awesome comps and you could be a winner. Good Luck! Got a question? Visit the FAQs page. Want to submit a comp for listing? Visit the Comp Promotion page. 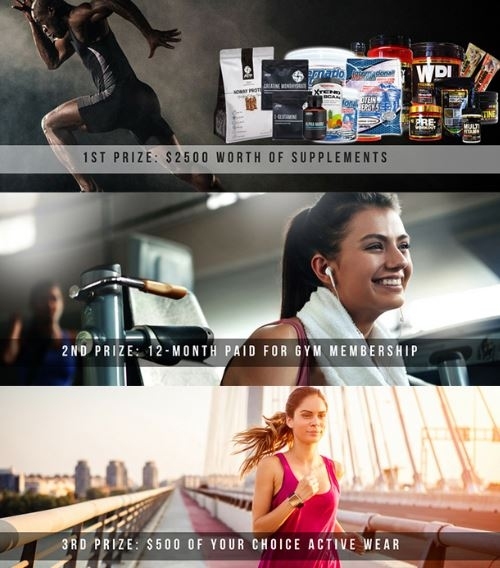 WIN Ultimate Fitness Packs - 1st Prize: 12 months free supplements ($2500 value). 2nd Prize: 12-month gym membership up to the value of $1500. 3rd Prize: $500 worth of your choice active wear. Note: Every competition has its own unique terms, entry methods, entry requirements, prize/s, prize values, closing/draw times, ways of announcing and notifying winners etc. for which the competition promoter is solely responsible. Any questions regarding a giveaway should be directed to the comp promoter NOT AussieComps.com.